Two of the three standardized field sobriety tests—the walk-and-turn test and the one-leg –stand test—are categorized as “divided attention” tests. That is to say, these two tests consist of a mental and a physical component and require you to divide your attention between the two components in order to successfully complete the requested task. Divided attention tests consist of tasks that are relatively easy for most sober people to complete. In that regard, most sober people are able to easily follow instructions while simultaneously performing a simple physical task. However, when you are impaired by alcohol or drugs, you typically are unable to perform a task that requires divided attention. When a driver who is suspected to be impaired by either drugs or alcohol performs either the walk-and-turn test or the one-leg-stand test, the police officer administering the test makes note of various indicators of impairment. As their names imply, both the walk-and-turn test and the one-leg-stand test are simple physical tasks. With the walk-and-turn test, the police officer will instruct you to take nine steps, walking in a heel-to-toe fashion, in a straight line. After completing the nine steps, you are then instructed to turn on one foot and return in the same fashion. While you are completing this test, the police officer makes note of certain indicators of intoxication which include loss of balance while walking and/or turning, waiting to begin the test until the instructions have been completed, and the ability to walk in a heel-to-toe fashion and take the correct number of steps. With the one-leg stand test, you are required to stand for 30 seconds with one foot approximately six inches off the ground while counting aloud by thousands. During this test, the police officer looks for such indicators of impairment as the ability to balance without swaying, using arms, hopping or putting a foot down. Both the walk-and-turn test and the one-leg stand test require a subjective analysis by the police officer performing the test. 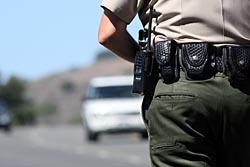 In that regard, scoring for the indicators of impairment can vary widely depending upon the training and experience of the officer administering the test. Consequently, these tests have been criticized as designed to fail.